Our program offers each student in the Shelby Elementary the opportunity each day to “walk and talk” or jog for a ten minute time period. We do this each day, by grade level, just before the students go in to eat lunch. This program works in partnership with our Safe Routes to School Program which extends the opportunity to walk or bicycle to school twice a week. This program was initiated by several teachers and myself in partnership with the Safe Routes to School Program in the hopes of establishing a life time habit of walking a little bit each and every day. We also theorized that if the students had the opportunity to walk and visit or jog and release a bit of extra energy, perhaps they would be more inclined to sit down, eat, and visit quietly in the lunchroom. We transitioned our program from a monthly prize incentive type program into an end of the year “Kids’ Marathon” celebration. 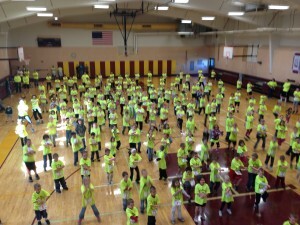 Using the premise that throughout the year each student easily walks 25.2 miles, at the end of the year our school staff and students jog/walk one mile to complete a marathon. We invite community members to participate in the fun run and to join us in a barbeque lunch. Our local volunteer fire department does the cooking; our law enforcement agencies block off the roads; our volunteer emergency medical services are present to ensure the safety (and visual support) of our students. 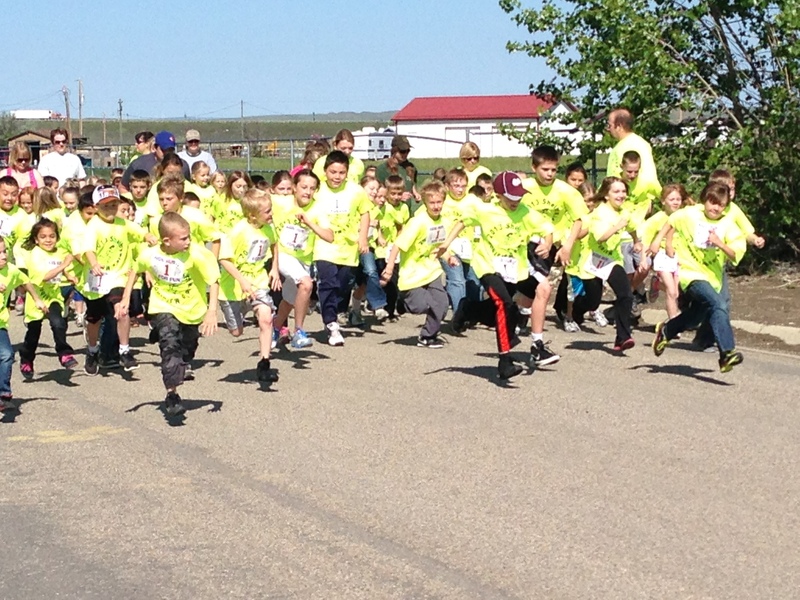 In the afternoon our students participate in a school-wide track and field day. 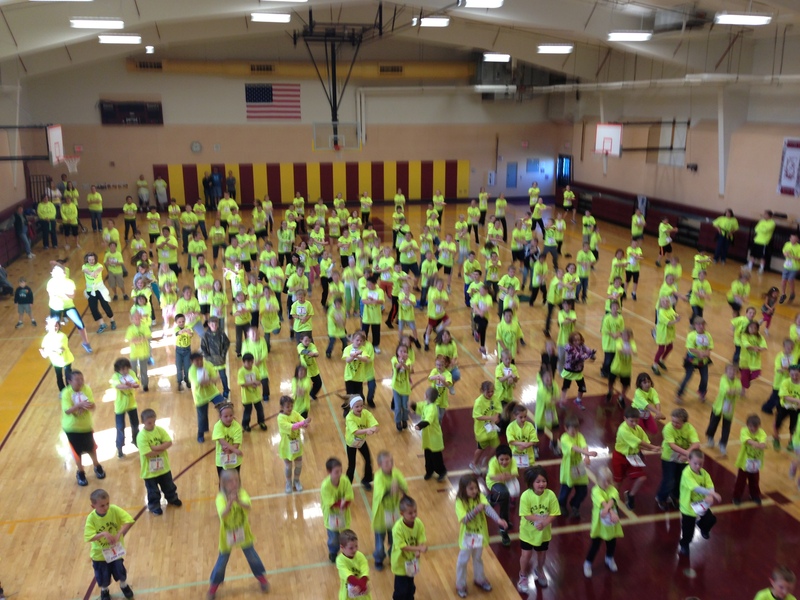 Through the generosity of local businesses, each student receives a t-shirt to wear during the fun run and to keep. As a school staff, we have noticed a quieter lunchroom. 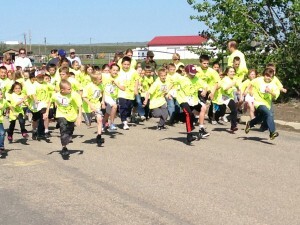 Students have also developed an awareness and have participated in other fun runs in our community and surrounding communities. I feel a great part of our success in our noon walking program is associated with the very visible support of our Walking Wheels Wednesday and Fit Friday program–each program supports and reinforces the other! A big bonus has been that our health enhancement teacher has noticed much better improved times during the timed mile fitness run—not so much in the more fit students but in those students who, in the past may have struggled completing a mile. We have seen smiles of accomplishment and more self-confidence in many of our students who may have felt that a mile was too great of a distance for them to complete! Posted in Active Living, Programs, Toole.